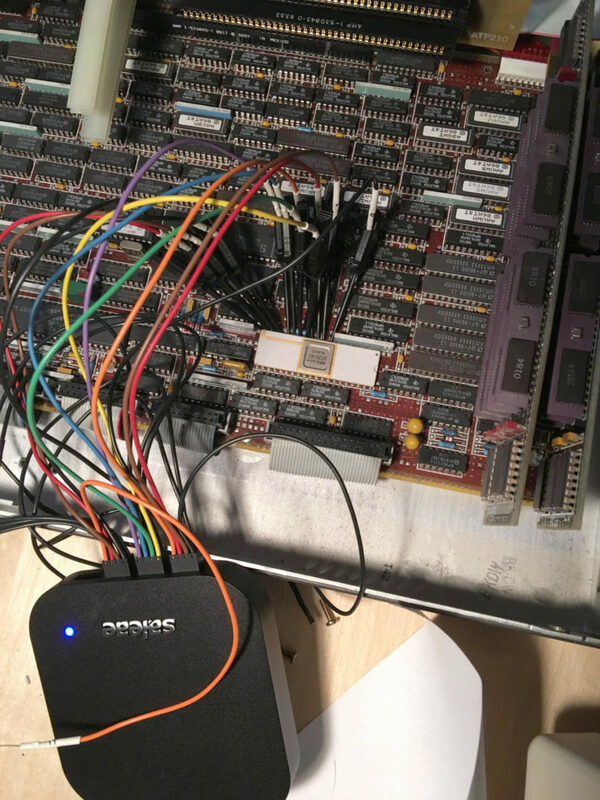 I spent last night probing my 3B2/310's hard disk controller with a logic analyzer so I can see exactly how it behaves, both with and without a hard disk attached to the system. It proved to be very tricky to get the logic analyzer probes attached because the motherboard is so incredibly dense. In fact, I couldn't get a probe attached to the chip select line no matter how hard I tried. There just wasn't any room to fit a probe between the chip and a nearby resistor array, so I resorted to using a little piece of wire to just touch against the pin. I could have used three hands for that operation. Unfortunately, the simulator still hangs after loading and executing /etc/init from the boot floppy, but now at least I know it has nothing to do with a badly behaving disk controller. I have proof that mine behaves the same way as the real thing.